I have a question for you: Which of the Spider-Man PS4 suits is your favorite? My answer is a bit of a cop-out: all of them. That may sound fanboyish, but if you could hear the feverish desperation in my voice, you might understand what I've only recently come to realize: I have a costume collecting addiction. My obsession with collecting all of Spider-Man's 28 costumes started small. "I'll only get the ones I have attachment to," I told myself. That meant the Classic Suit (Repaired), Scarlet Spider Suit, Spider-Man 2099 Black Suit, Spider Armor Mk IV Suit, and the Vintage Comic Book Suit. 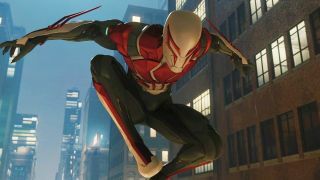 Five optional suits, plus the one you start with, plus the specially-designed Advanced Suit we've seen in all the trailers and screenshots, for a total of seven. That's not so bad, right? Spider-Man for PS4 is a fantastic game that succeeds on many fronts. But truth be told, there's quite a bit of busywork to be completed. Sure, most of it is optional, but that doesn't change the fact that from side missions to lost pigeons, there's a lot of stuff in Insomniac's version of New York City. Looking for a break from the main story and wanting to clear my map of some clutter, I started tackling these side objectives. Before I knew it, I had a not-too-shabby collection of tokens of all kinds: backpacks, crime, research, and landmark flavor, mm-mm! "Well I've got these sitting in my inventory, might as well spend some," I thought. At this point I was able to check the Scarlet Spider Suit off my list, but I still had plenty of tokens to spare. "Well, the Noir suit is kind of cool..." Buy. "And they did do a pretty good job with the Homecoming suit..." Buy. "And I'm having trouble with gunmen, maybe the bulletproof power from the Spider Armor Mk II would be good?" Buy. You see how the pattern started. Every time I needed a break from the main story or only had a short amount of time I could play, I would earn a few tokens. And of course, I didn't want said tokens to go to waste, so I spent them on suits. But the thing was, I wasn't even really taking time to enjoy my new prizes. Maybe I'd take a screenshot or send a Snapchat to my friends to show off, but I'd immediately go back to the Insomniac-designed Advanced Suit every time. In short, I was collecting suits for the sake of collecting - a problem that came to a head when, for the first time since starting the game, I didn't have enough tokens. Among Spider-Man PS4's many side activities are special challenges given to you by the sometimes-villain Taskmaster. These include things like swinging accurately through a series of orbs (which gave me flashbacks to Superman 64) and stealthily taking out armed mercenaries as fast as you can. Completing these earns Challenge Tokens, which are needed for a few suits and various other upgrades. Only too late did I realize that by spending the Challenge Tokens I'd earned on suit upgrades and gadgets did I realize I wasn't going to have enough to buy the last few costumes on my shopping list. I would have to go back and (ugh) redo the challenges in order to earn more. I'd earned a few Bronze-tier rewards from my first go-round, but I would still need to earn at least one Gold in order to afford everything I wanted. Sitting there on my couch, my eyes dry as the Mojave sands from a marathon play session, I grimaced as I did the math in my head. In order to earn the reward I sought, the developers expected me to play and get better at the game? How dare they. How dare they?! Minutes turned to hours as I practiced, tried, failed, and tried again to earn the tokens I needed. Finally I had enough to buy... Spirit Spider? Fear Itself? Wait a minute, I didn't even like these costumes - had I really just spent hours grinding out marginally tolerable performances just so I could unlock costumes I disliked and didn't have any intention of wearing? Yes. Yes I had. And that wasn't even the worst of it. I mean, look at that doofy get-up! That is literally just Peter Parker wearing a college T-shirt with a Spider-Man mask. I won't mix words: I think that suit is dumb, dumb, dumb. It's ugly. It's boring. It's not tied to a memorable or beloved moment from the comics. Not at all a suitable reward for finding one secret photo location, let alone 50.